Two recent events have provided us clear view of the difference between those who wish to communicate clearly the science of climate change and those wish to deny it. 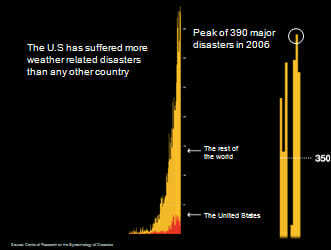 We believe that the increase seen in the graph until about 1995 is explained partly by better reporting of disasters in general, partly due to active data collection efforts by CRED and partly due to real increases in certain types of disasters. We estimate that the data in the most recent decade present the least bias and reflect a real change in numbers. This is especially true for floods and cyclones. Whether this is due to climate change or not, we are unable to say. We appreciate that you have pointed out the issues with the CRED database and will make the switch back to the data we used previously to ensure that there is no confusion either with regards to the data or attribution. When the error was brought to their attention, they admitted their mistakes and corrected their presentation. Not bad. Obviously Gore should have been more careful and avoided the error in the first place, but no one is perfect and mistakes (as long as they are few and far between) aren’t that big a deal, as long as they are admitted to and quickly corrected. One the other end of the scale we have George Will, who recently penned a column in the Washington post full of verifiably wrong information about climate change. If Will and the others take this argument seriously, it seems incumbent on all of us interested in the climate change debate to go back to the 1970s, to better understand why scientists might have gotten it so wrong, so we could learn from and avoid their mistakes. But when you do that, you find that it is Will who is getting it wrong. 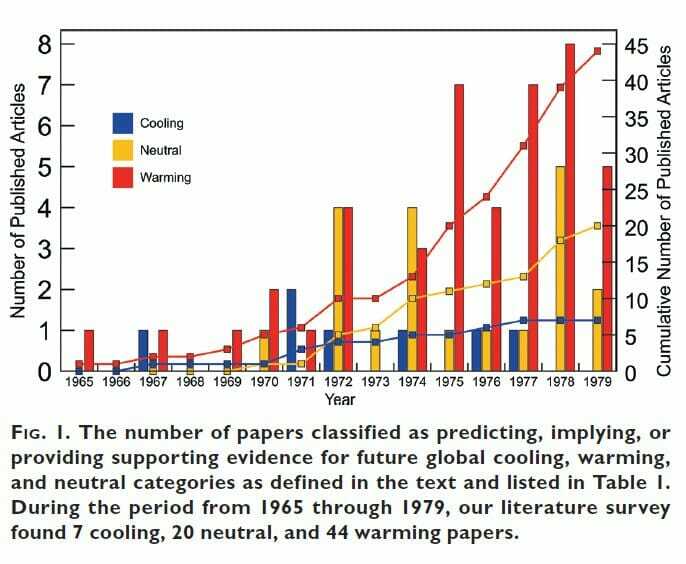 Regardless of your position on climate change, it takes a great deal of dishonesty to continue to claim that in the 1970s the consensus amongst scientists was of global cooling. According to the University of Illinois’ Arctic Climate Research Center, global sea ice levels now equal those of 1979. We now know where George will got his sea ice data. He didn’t bother to go to the original source, instead he went to the notoriously inaccurate DailyTech, and got his data there. Relying on a third party for information without at least checking the original source should be an unacceptable practice for a supposedly respected columnist writing in a prestigious paper. When the third party source is notoriously unreliable editors, fact checkers (the Washington Post does have some right?) should immediately put a halt on the column. But that didn’t happen. Instead we get Will’s absurd claim about sea ice, which is verifiably wrong and misleading. According to the UN World Meteorological Organization [WMO], there has been no recorded global warming for more than a decade. This is the classic 1998 denier cherry pick, and is evidence the Will doesn’t want to present an accurate look at the issue. Furthermore the WMO’s latest statement on the issue says the opposite. So faced with these errors, what did George Will and the Washington Post do? Did the issue a correction? Nope. Did they issue a retraction? Nope. Did they ignore them and move on? Nope. They let Will write another column and repeat the same lies again. Apparently accurate facts aren’t necessary at the Washington post, and yet to people wonder why Newspapers are in decline? Eat a lot of asparagus. Enter the Post’s headquarters building. Use a public restroom. Don’t flush. An optional fifth step is to notify the Post that this represents your opinion of their editing process, but I think even they will eventually figure it out. I also thought about advocating peeing on the restroom floor, but some poor janitor would have to deal with that. On the other hand, if there’s a science believing, asparagus eating ninja out there who can penetrate the editorial office, then Fred Hiatt’s desk and chair and are emphatically fair game. I acknowledge that asparagus pee is a long shot for turning the Post around. On the other hand, they’ve refused appeals based on fact, reason, and truth. Asparagus pee is the level at which they operate. Time to fight fire with fire. So despite the fact that Al Gore receives considerable flak, he has shown himself to be responsible and capable of admitting fault and correcting his message when reasonable complaints are made. George Will on the other hand hand has shown himself to be irresponsible and stubborn even when what he publishes is verifiably wrong. And that is no way for someone in the media to behave. When a reputable newspaper lies, it poisons the community; every newspaper story becomes suspect. Given all of this, the difference between George Will and Al Gore should now be abundantly clear to anyone. Yet guess who gets more flack? George Will’s recent columns demonstrate a very troubling pattern of misrepresentation of climate science. They raise some interesting questions about journalism, specifically concerning the editing process. Editors and fact checkers are there to ensure that publications like the Washington Post don’t print factually incorrect information… Will’s climate change columns are a case study in how one can cherry pick scientific data to fit their own agenda. For those counting, that is now a total of 4 articles in the Washington Post (and countless others elsewhere) debunking George Will’s arguments. Does this mean we expect a correction from Will anytime soon? Doubtful. But that is par for the course for deniers. Given these new rebuttals I have decided to write a new post to highlight them. So many people who deny Climate Change will sit in their big fat pickups or SUVs idling away while people choke walking past them. What emissions? At the ferries I started knocking on doors to inform them about bylaws on idling. That turned out to be a life threatening experience. Now I leave little print outs with some facts from Environment Canada. Quite the line of traffic for the Obama arrival in Canada. And when PM Harper had to go a block or 2 to visit the GG he took a half dozen limousines. Glad you liked my asparagus pee proposal, Dan. Too bad that it’s needed, but I would love it if someone carried it out. I’d do it if I was anywhere near Washington. Thanks, I thought these recent events were a clear illustration of the difference between those who wish to communicate clearly the science of climate change and those wish to deny it. The fact that George Will made several errors, isn’t such a big deal. The fact that when shown his errors he denied them is. The fact that the Washington Post backed him up, despite the fact that his errors are verifiably wrong is an even lager deal.